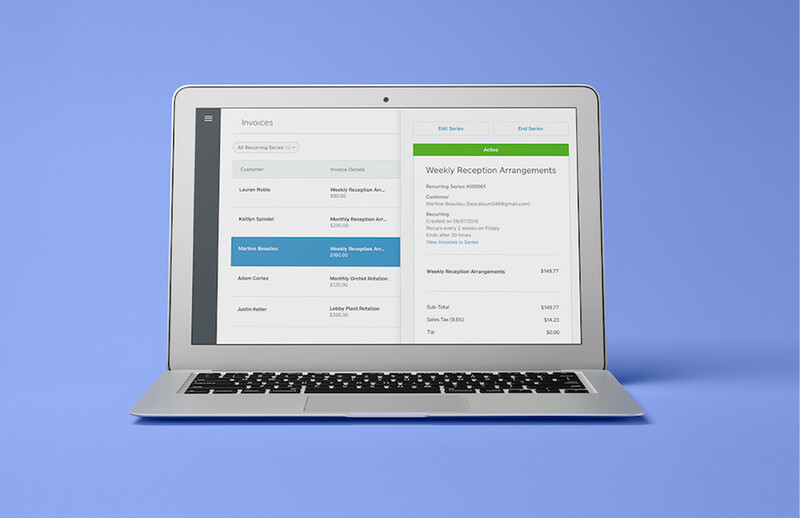 Square Invoices just got even better. Now you can set up recurring payments to automatically get paid each month, week, day or even year. With this new feature, there’s no need to chase down clients, take cards over the phone or re-enter the same info month after month. It’s billing made simple. Invoices, including recurring payments, are always free to send, and cost only 2.5% per invoice to be paid online. Square Invoices is a hugely popular way for sellers to get paid - last month alone, 600,000 invoices were paid to sellers globally. They’re safe, secure and easy for you and your clients. Best for Automated recurring billing for amounts that don’t change week-to-week or in any given billing period - like subscription services. Easily invoice repeat customers for amounts that may change from week to week or in between billing cycles. A wide variety of businesses set up recurring invoices to save time and get paid faster. Florists who deliver weekly arrangements, dog walkers, fitness centres and yoga studios, cleaning services and subscription services like produce boxes and ‘beer of the month’ clubs all use recurring payments. Higher-price-tag businesses like wedding planners, home repairs and lawyers also set up recurring payments as a convenient way to split costs across multiple payments for their clients. Setting up recurring payments with Square is easy. Invoices are free to send and you pay a competitive processing rate only when they’re paid securely online. You can set up recurring payments to be automatically emailed to your clients at the frequency you choose. Or you can print them out and deliver them to a job site. If your customers store their credit or debit card info on file, recurring payments can be paid automatically. Invoices are always free to send and there’s no cost for recurring payments. If customers pay securely online with a credit or debit card, you pay 2.5% per invoice. When customers authorise you to securely store a card on file, you get paid even faster and still pay only 2.5%. Yes, you can set up recurring payments to invoice your clients daily, weekly, monthly or even annually. When a merchant sets up a new recurring payment series, they can allow their buyer to save their credit card on file. The buyer sees the first invoice from that recurring series with a checkbox to save their payment details. Just like all other invoices, your buyer gets a few attempts to put in the right payment information (card number, expiration date etc.). If the card fails after those attempts, both the merchant and buyer are notified by email that a particular transaction has failed. The recurring series stays intact and will continue to send the next instances in that series, but the merchant will have to re-send a single invoice if they want to re-try getting payment for the invoice instance that failed. When a merchant has a recurring series that includes a saved CoF payment, the credit card on file could be (at some point in the series schedule) past its expiration date or fails for another reason. In that instance, Square automatically falls back to sending an invoice where the buyer can enter new card information. Both the merchant and buyer are notified that the card on file wasn’t charged. And the buyer can still pay the regular invoice through the normal invoice pay web page (where they will also have the option to save a new card on file). In the case that a new/different card is saved on file, the merchant will get an email that the invoice was paid with an updated CoF. See our FAQ on how to make your Invoices business to business friendly here.